Samsung has recently launched its latest smartphone Galaxy S8 with some great features including wireless charging and Iris scanner. Samsung claims that its Iris scanner provides the safest way to unlock your device with the help of scanning your eyes. 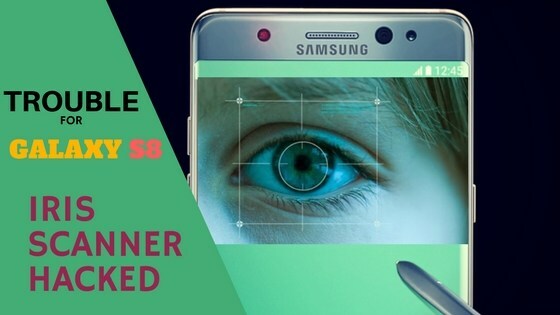 A group of hackers,Chaos Computer Club, have already successfully bypassed Samsung Galaxy S8's Iris scanner with the help of photo and contact lens. A German hacker group has done it using a picture of the owner's eye with a contact lens placed on top of it, to mimic the curvature of a physical eyeball. According to the hackers, you can fool the iris scanner with a picture taken from social media sites but they said digital photographs taken in night mode work best. Dirk Engling, Spokesperson of Chaos Computer Club, said that " If you value the data on your phone and possibly want to even use it for payment using the traditional pin protection is a safer approach than using body feature for authentication." He added that " The security risk to the user from Iris recognition is even bigger that with fingerprints, as we expose our irises a lot. Under some circumstances, a high resolution picture from the internet is sufficient to capture an iris." Samsung Galaxy S8's Iris scanner fails on a regular basis as it does not work properly in bright light and when you are moving.